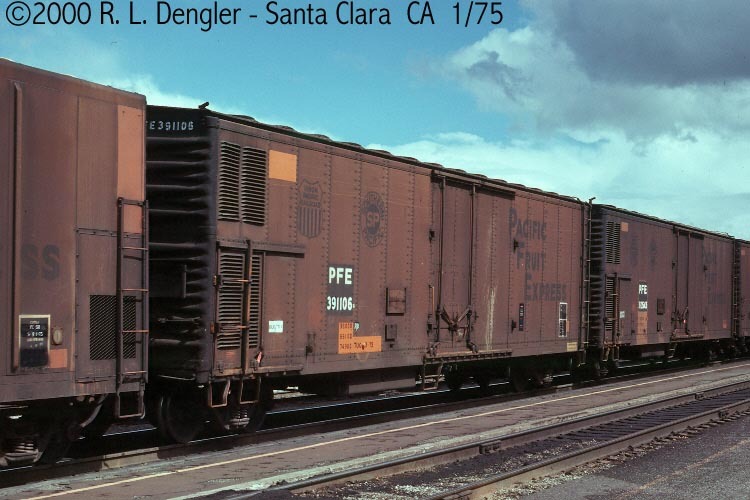 These 50' ice bunker refrigerator cars were all built to the same basic design by ART in 1946 and featured XXXX ft3 capacity, overhead ice bunkers, 10 hatches and a 5'-0" dual hinged doors. They were purchased by PFE in 1950, meat rails were installed and they were renumbered as above. They were rebuilt in 1954 to mechanical refrigerators and renumbered as above. The mechanical equipment was removed in 1972-74 and they were renumbered 390713-391212.